Just after he crossed the chequered flag after 60 laps of hard racing at the Nurburgring, Seb Vettel shouted "That was tough!" to his team over the radio. "They gave me a run for the money," Vettel continued, before whooping and shouting a little more. Needless to say, the triple world champion was delighted. He'd won the race that had eluded him for these many years, finally putting an end to the German GP home race curse that seemed to plague him. 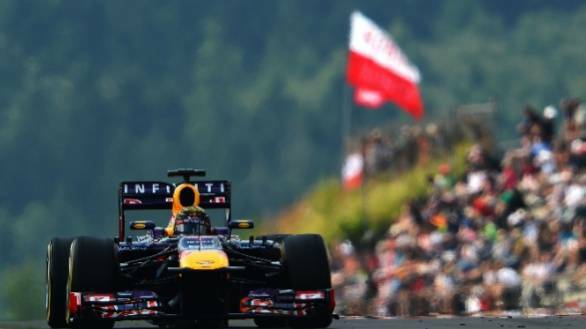 Along with the win, Vettel further solidified his lead at the head of the championship standings. When you look at it on paper, Vettel started second on the grid and finished first, it looks a lot simpler than it was. He wasn't kidding when he said it was tough, though. So, who were Vettel's main rivals through the race? It really was the Lotus F1 cars of Kimi Raikkonen and team-mate Romain Grosjean. When the five red lights went out, it was Vettel and Webber who swooped past pole sitter Lewis Hamilton. And while Webber was able to hold on to second place until the first round of pitstops, things all came undone when a tyre came loose off his Red Bull and bounced down the pitlane, taking with it a hapless cameraman. Hamilton was caught out when his Mercedes proved once again that it didn't quite agree with the Pirellis. The British driver started struggling with tyres that seemed to have very little grip, and slid back down the order. The team that seemed like they quite liked the Pirellis was Lotus. While woes plagued everyone else up and down the order, Lotus was on the pace, with Grosjean even managing to last five laps longer than Vettel on the option soft compound tyres. This meant that Grosjean moved up from fifth place to second and was then able to stay right there, breathing down Vettel's neck. Meanwhile, a Safety Car situation brought on by Jules Bianchi's Marussia rolling backwards down the track meant that Raikkonen was able to catch up as well. Towards the closing stages of the race, given that Kimi was faster than his team-mate, and was a championship contender, Lotus made a call to let the Iceman go past Grosjean. But it wasn't soon enough. Raikkonen closed the gap to Vettel to one second, used DRS, but ran out of laps. And so Seb Vettel won the German Grand Prix, from Raikkonen and a somewhat sullen-faced Grosjean.